The Red Wyvern™ by KMLabs is the only variable repetition rate amplifier in today’s high energy kHz class market. Offering industry leading computer-controlled tuning of repetition rates and the highest scalable pulse energies available in the market. Wyvern series amplifier systems operate over a range of repetition rate ranges between 1 and 50kHz. Make sure you answer these questions before buying any ultrafast amplifier, and future-proof your system! 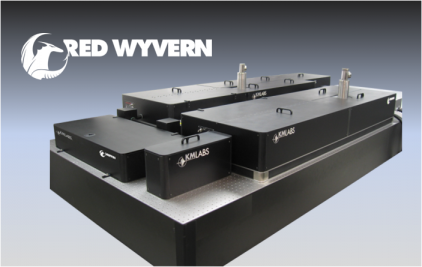 The Red Wyvern uses regenerative amplification to generate pulses that are below 40 fs in duration with up to 5mJ pulse energy, up to 30 W in average power. KMLabs uses compact He-gas cryo-cooling systems or liquid He cryorefrigerator systems. These are compact, fully-interlocked, and maintenance-free and can be configured to minimize vibration for demanding applications. Read more about the benefits of cryo-cooling.